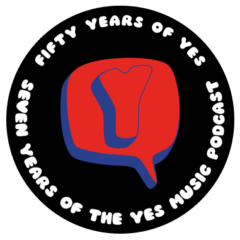 The seventy-seventh episode of the Yes Music Podcast featuring an array of amazing memorabilia sent in by listeners. Listen, view the slideshow and/or watch the YouTube video then let me know what you think by contacting me via any of the different routes on the right hand side or by leaving a comment below! What an amazing collection – what’s your favourite? Do you have any other objects you’d like to contribute? Would you also like to see some Roger Dean wallpaper? Excellent episode Kevin – it was so great to hear Jeremy’s memories. Jeremy and I might have been at the same Tormato gig at Wembley but sadly I don’t have those old tickets any more and as they played 6 gigs (those were the days!) we’ll never know. Thanks Ken and also thanks for your own contribution! It was indeed a great chat with Jeremy – what a global network of Yes fans! Chris does use the triple neck but not the one in Jeremy’s pictures, as I understand it. The original is in a Hard Rock Cafe somewhere, according to the guitar technician on the current tour…shame in my opinion. Certainly is a wonderful object! Thanks so much for your contributions, Jeremy. Thanks, Joost and thanks also for your contribution – a great shot of you! Perhaps Ben can let us know the answer to your question… I’ll change that mistake in a moment and thanks for spotting it. Like Yes themselves, your instrument has a fascinating history – although I can’t pretend to understand the technicalities! Thanks for the reply! I think the 4001 had a different shaped pick up cover, which was split in the middle. His looks like a later model. Still it is ultra cool to have that scratch plate signed. If I were him, I’d get a new one and keep the signed one in a frame. That’s true, I didn’t even notice. 4001’s have a horseshoe bridge pickup, so it’s not a cover it’s actually part of the pickup design. I know many bass players that took off the horseshoe though, including Paul McCartney, but Chris always kept his. Could be this 4001 used to have the horseshoe but the previous owner lost it, then replaced it with the 4003 type pickup cover. Maybe Ben can further enlighten? Gryphon: well worth further investigation. Really excellent musicians and very entertaining live thanks to their rapid instrument-swapping approach. Deserve an award for best use of oboe in rock music. By an amazing coincidence, as I write this, I’m wearing a T-shirt from their one-off reunion gig in 2009. A few tracks are on Spotify, but no complete albums. I saw them at Crystal Palace in 1974, as part of the lineup that culminated in Rick Wakeman’s Journey to the Centre of the Earth, complete with orchestra, choir and inflatable dinosaurs. Thanks, Russell. I have watched a YouTube video of that 2009 gig I think after J.J. Delmas tweeted it a couple of weeks ago. I now appreciate the artistry involved – very interesting stuff! The 1974 gig sounds ‘interesting’…an amazing performance to have witnessed! Take look here for a great photo and memories of that very event at Crystal Palace (I have some photos too somewhere that I took with my Kodak instamatic but I was too far away). Indeed, I keep staring at that last photo of “the crowd” as I’m in there somewhere – but I haven’t yet worked out which one is me! Previous Previous post: Top 20 place in the European Podcast Award for Yes Music Podcast!